Dr. Donald Erbschloe, Air Mobility Command chief scientist, and Col. Keith Boone, AMC Fuel Efficiency Division chief, spoke with Tahan Pangaribuan, Solar Impulse flight director assistant yesterday. Solar Impulse is currently hanging out at the Lambert-St. Louis International Airport where it landed June 4. Air Mobility Command officials visited the Solar Impulse at Lambert-St Louis International Airport June 6, 2013. (U.S. Air Force photo). 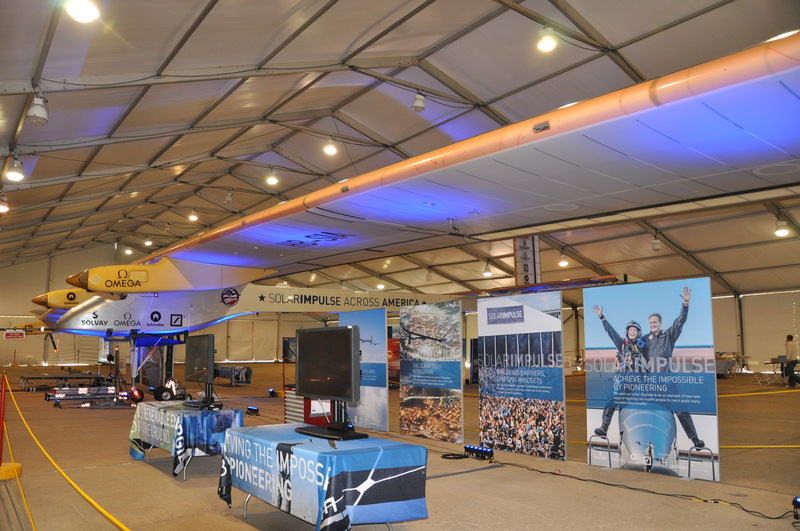 A solar-powered airplane, the project began in 2003 with a 10-year budget of 90 million euros ($112 million). Bertrand Piccard and Andre Borschberg, Swiss pilots and co-founders of the project, take turns flying the plane. It is the first attempt to fly across the United States using no fuel but the sun’s energy. Developers hope to eventually pilot around the world, but for now, the aircraft has a specific route: It took off from Moffett Field, a joint civil-military airport near the south end of San Francisco, heading first to Phoenix on May 3. It made an additional stop in Dallas/Ft. Worth before heading to St. Louis. Next it will be on its way to Washington Dulles International Airport in Washington, D.C. The flight team hopes to conclude the plane’s cross-country voyage in about two month’s time at John F. Kennedy International Airport in New York. Air Force scientists met with Solar Impulse’s flight director assistant as part of the Department of Defense’s efficiency initiative to further lookout for innovative, cost-effective solutions to augment mission effectiveness. Solar Impulse weighs 3,527 pounds and has the wingspan of a 747-400 jet. Washington Dulles International Airport held a contest to randomly select 50 interested individuals for a chance to view the landing of the Solar Impulse up close. If you didn’t make the cut, visit the team’s Facebook to see their takeoffs and landings on video.